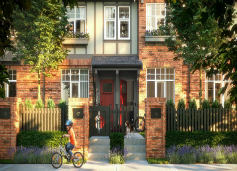 Victoria townhome development is located on Victoria Avenue, close to the newly updated Victoria Park. These 4 & 5 bedroom rowhomes are slated to arrive in the spring of 2018. Mosiac is famous for delivering high quality finishes with great layouts and tranquil outdoor spaces.